Hardcover, 9 x 10.5 in. / 264 pgs / 215 color. Edited by Doryun Chong. Text by Doryun Chong, Michio Hayashi, Miryam Sas, Mika Yoshitake. 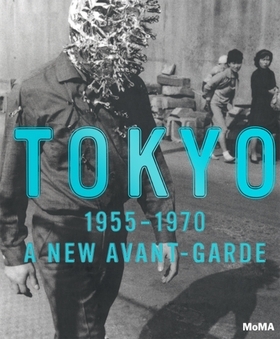 Tokyo 1955–1970: A New Avant-Garde explores the extraordinary convergence of artists and other creators in Japan’s capital city during the radically transformative postwar period. Examining works from a range of media--painting, sculpture, photography, drawing, printmaking, video and film, as well as graphic design, architecture, musical composition and dance--this is the first publication in English to focus in depth on the full scope of postwar art in Japan. During this period, Tokyo was a vibrant hub that attracted such critical artistic figures as Taro Okamoto, Hiroshi Nakamura, Ay-O, Yoko Ono, Mieko Shiomi and Tetsumi Kudo; photographers Daido Moriyama, Eikoh Hosoe and Shomei Tomatsu; illustrators and graphic designers Tadanori Yokoo, Kohei Sugiura and Kiyoshi Awazu; and architects Arata Isozaki and Kisho Kurokawa; as well as many important artists’ collectives. Curator Doryun Chong’s essay investigates Tokyo’s sociopolitical context and the massive urban changes that set the stage for the city to emerge as a vital node in the international avant-garde network. Essays by scholars Hayashi Michio and Miryam Sas and curator Mika Yoshitake discuss critical concepts in art and culture at this time, including “graphism,” which manifested itself across various mediums; the development of new sculptural languages; and the “intermedia” tendency that engendered provocative cross-pollination among artistic genres. Masatoshi Nakajima provides an illustrated chronology and Yuri Mitsuda supplies artist biographies. Tokyo 1955–1970: A New Avant-Garde brings fresh insight to this dynamic metropolis during a time of remarkable artistic burgeoning. Featured image, by graphic designer and illustrator Tadanori Yokoo, is reproduced from Tokyo 1955-1970. "Tokyo 1955-1970: A New Avant-Garde," opening November 18 at New York's Museum of Modern Art (through Februrary 25, 2013) looks back at the multidisciplinary art that emerged during the city's tumultuous postwar era. A new artistic language was fomenting in the cultural chaos: from the work of Yoko Ono to the gritty photography of Moriyama Daido to the radical advances made by its architects, designers, and filmmakers. "In less than 20 years, Japan went from complete devastation to having the world's second largest economy," says Doryun Chong, the exhibition's organizer. "That's a jarring experience. It was very confusing - but also exhilerating for artists." There was no establishment - few galleries and no art market to speak of - so artistis pollinated across disciplines and threw themselves into the fray, at times literally. The devastation wrought by War II on Japan gave rise to generation of artists almost World a wholly constituted by a new, increasingly urbanized order. During this “heady, chaotic, and altogether exhilarating span,” writes Chong, artists began utilizing public space; collaborating in collectives, such as Jikken Kobo and the Gutai group; and activating the body in performance-based works. Still, says Chong, “Their work was also a salvaging operation in search of the legacy of prewar avant-gardes, both Western and Japanese.” With essays and biographical sketches of all the major players, including Kojima Nobuaki (1), Yoko Ono, Daido Moriyama, and Eikoh Hosoe, the book provides context and depth for the Museum of Modern Art’s exhibition, on view through February 10. Six contributors detail the artistic ferment, encompassing numerous radical groups as well as individual artists using every conceivable medium, that was fostered by the social transformation of midcentury Japan. The November issue of W magazine devotes a full page to The Museum of Modern Art's forthcoming exhibition catalog, Tokyo 1955-1970: A New Avant Garde. "Today when we look at works of art at an exhibition opening, we may be aware of apparently peripheral issues—who funded the exhibition, for example, or what history of relationships led to the inclusion and exclusion of particular artists. We may notice the wires leading from the corners to power speakers for the projections, and think of what city structures keep them working. Or we may attend to who is invited to the opening, who are the staff members, the exhibit designers, the bartenders by whose hands the event is coming to realization; and below that, what kinds of beams support the floor of the building, the history behind the architectural developments that made those spaces possible. In the 1960s Japanese art world, in a time of rapid growth economics and a tumultuously changing media landscape, artists and event organizers working in collectives pulled such seemingly marginal issues to the core of their intermedia works. Explicitly or implicitly, they turned the camera around to the backstage, to the very question of arts institutions, urban spaces and human networks. By doing so they tried to reinvent art itself, to come up with a mode of artistic act (with or without the label “art” attached) that would be commensurate with the “feeling of Being in the contemporary age." - Miryam Sas, excerpted from the chapter, "Intermedia, 1955-1970." FORMAT: Hbk, 9 x 10.5 in. / 264 pgs / 215 color.